He has already entertained (and angered) Congress during an immigration hearing. 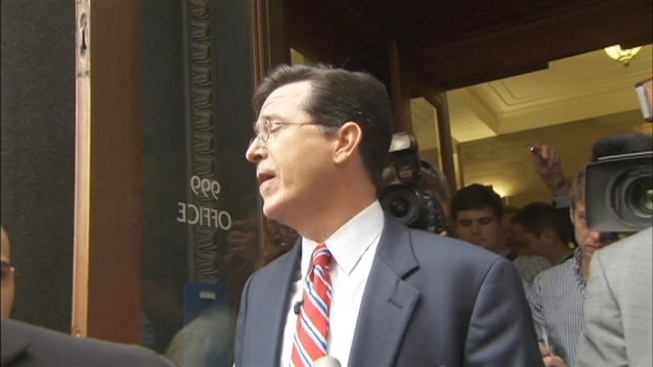 Now, Stephen Colbert is taking his talents to the drab halls of the Federal Election Commission. "I'll be @ FEC in DC @10am and speaking at 11ish. During the hour in between I'll be giving commissioners backrubs." Colbert’s political action committee has been the crux of months-long satire aimed at mocking campaign finance law, which allows corporations to donate unlimited amounts of money to elections. Colbert, on the other hand, wants to use PAC for his own personal enrichment. “You, the Colbert Nation, could have a voice in the form of my voice shouted through a megaphone made of cash,” Colbert said during his last trip to D.C., according to the Washington Post. But, the Post reports than several government experts are worried that Colbert’s request to create his own PAC (and have his parent company, Viacom, support it) will blur the line between television personalities and politicians, as well as open the door for media companies to freely donate too, or even become, political groups. And Colbert has hit some legal roadblocks on the way. For example, according to the Post, any work on behalf of Colbert’s PAC that is connected to his show could be considered an in-kind contribution from Viacom, and that would have to be reported to the FEC. There are several questions facing the FEC commissioners over Colbert’s “super PAC” according to the Post. First, should the host be given a press exemption so he can discuss his PAC on the air? And will Viacom have to report any help as a political contribution? And what about ads? Can Colbert use Viacom resources for those? The Post says attorneys for the FEC already have three possible answers drafted, all of which appear to let Colbert promote the PAC on his show without having to report it as political spending.